Community bank offers financial services to Libertyville, Illinois. Private detective agency serving Northern Illinois, Lake, Cook, and McHenry County. Offices in Antioch and Libertyville. Providing the North Shore and Lake County areas of Northern Illinois with wedding, portrait and commercial photography for over 25 years. Based in Libertyville, IL. Offers new and used bikes, service, parts, accessories and apparel. Includes dealer information, store hours and a location map. Located in Libertyville,Illinois. Offering new and used horse trailers and stock trailers. Authorized dealer for Trail-et, 4 Star and Moritz. Financing Available. Located in Libertyville, IL, USA. Accent land design-landscape architects and contractors located in Libertyville, Illinois. Information on the staff, list of available treatments, and a newsletter. Libertyville. Based in Libertyville Illinois. Providing training, engine repair, and powered parachuting sales. Established in 1987 in the Hudson River Valley. Offers wines under the Rivendell and Libertyville Cellars labels. Open for tours and tastings. Gift shop on site. Libertyville pub brewers of Abana Amber, Scapegoat Maibock, Classic Irish Stout, R.K.s IPA, and Gudenteit Hefe Weizen. Features history, menu, events, brewing process, beer list and awards. Offers state-of-the-art treatment of varicose veins, laser hair removal and skin rejuvenation using FotoFacial-RF. Find information and contact details. Located in Libertyville, Illinois. Libertyville-based social bicycle club interested in touring, off road riding, mountain biking, ultra marathon and competitive riding, and cycling advocacy. Design, Flash, database development, search engine submissions, domain name registration, and hosting. Located in Libertyville, Illinois, United States. libertyville family law attorney providing services relating to divorce, adoption, paternity, alimony and child support. The National Shrine of St Maximillian Kolbe is perhaps better known as Marytown. It is located in Libertyville, Illinois and staffed by friars of St Bonaventures Province. A full service comic and gaming store located in Libertyville, Illinois. this magazine, both on-line and printed is put together by students in libertyville high school, and features poetry, columns, articles, comics, photos, and drawings. SiteBook Libertyville City Portrait of Libertyville in Illinois. 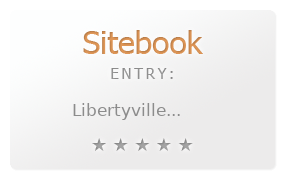 This Topic site Libertyville got a rating of 4 SiteBook.org Points according to the views of this profile site.